During the late summer the number of wasps around our garden increases dramatically. Although similarly coloured and striped black and yellow, they are not the same species as the wasps that fly into houses and around outside tables seeking to share our food, (although we do get them too, in small numbers). These are members of the generally less intrusive Polistes genus, the most common type of Paper Wasp. They are the builders of the papery open- celled nests seen suspended upside down beneath the tile overhang of roofs, or out in the open campo, attached to a plant (Prickly Pear cactus pads seem to be popular sites). 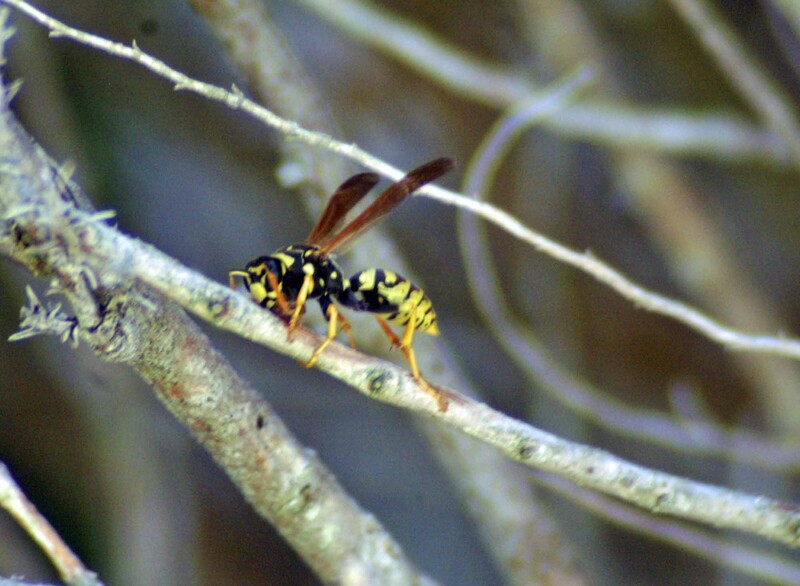 Polistes is the most common genus among social Wasps and has a worldwide distribution. 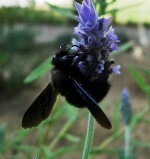 In Europe and North America their colonies outnumber those of all other social Wasps combined; although they are present in central Europe, they are not found in the UK and are rare in northern Europe.Two species that resemble each other closely, P. dominulus and P. gallicus are the most widely spread in Europe and are especially relevant in Mediterranean areas. Description: Polistes sp. or Paper Wasps, are 3/4 to 1 inch long, slender, narrow-waisted wasps with smoky black wings that are folded lengthwise when at rest. They may be quite easily identified by their characteristic flight as their long legs dangle below their bodies. 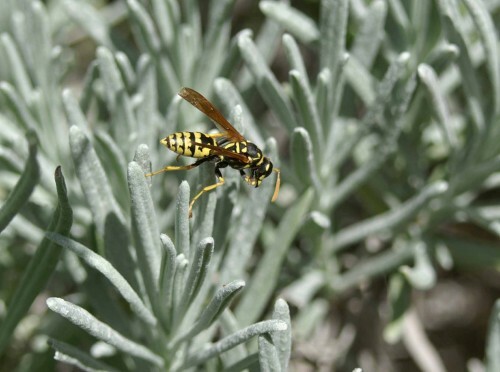 I have read various accounts of Polistes wasps that state them to be aggressive, but personally have not found that to be the case; the only two incidents involving them stinging have both occurred when they have been inadvertently stepped upon by people with bare feet. Being one of the people stung I can say it really hurt for a while! 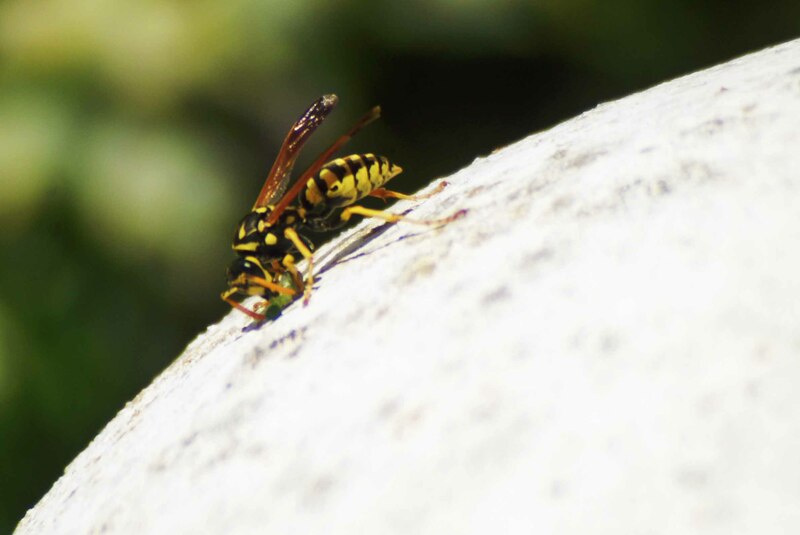 All Polistes species are predatory, so of course are equipped with a sting with which to paralyse prey and if threatened they can be provoked into defending their nests. Paper wasps are semi-social insects and have a relatively simple life cycle, which is well suited to a warm climate such as in the Mediterranean. Fertilized queens, which appear similar to workers, overwinter in protected habitats such as cracks and crevices in structures or under tree bark, or in the case of those around our house, under the roof tiles. In the spring they select a nesting site and begin to build a nest. 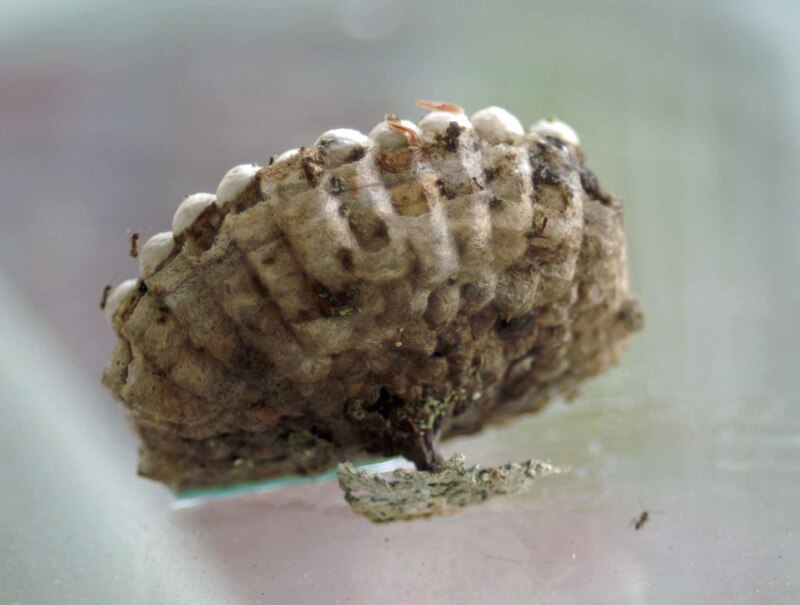 Eggs are laid singly in cells and hatch into legless grub-like larvae that develop through several stages (instars) before pupating. The cells remain open until the developing larvae pupate. 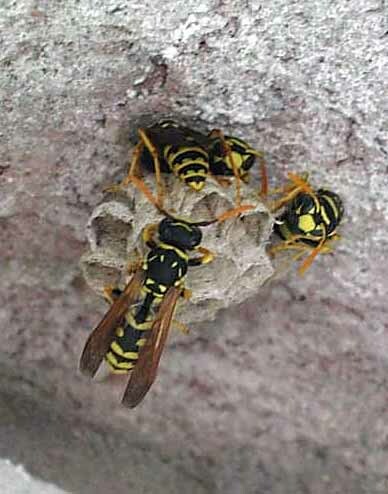 The first to emerge will become daughter workers in the growing colony and tend to be sterile and smaller and assist in further building and defending the nest and feeding developing young.A mature paper wasp nest may have 20 to 30 adults. Later broods are fertile, providing for several queens; sexual larvae are produced starting in August, and in September adults (including the only recently produced males) leave the nest and mate outside. 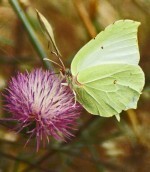 Mated females then seek a safe place to hibernate. The remainder of the colony does not survive the winter. 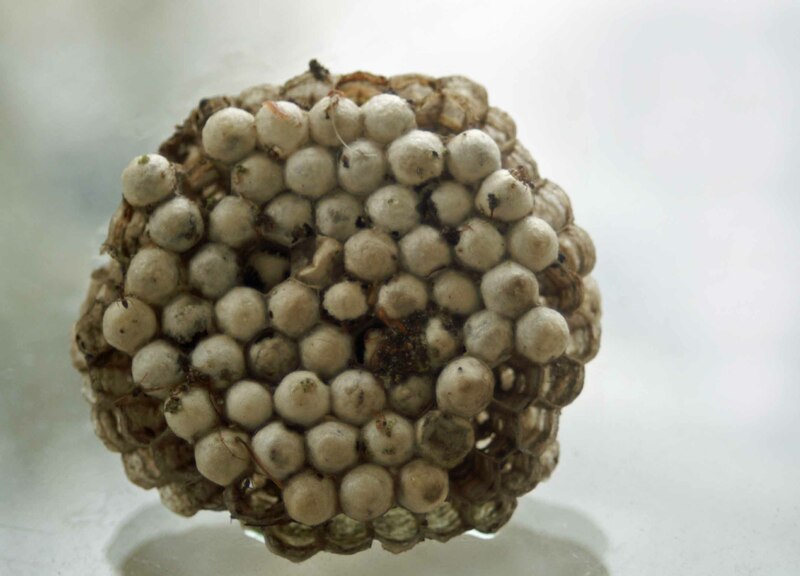 In late summer, queens stop laying eggs and the colony soon begins to decline. In the autumn, mated female offspring of the queen seek overwintering sites. 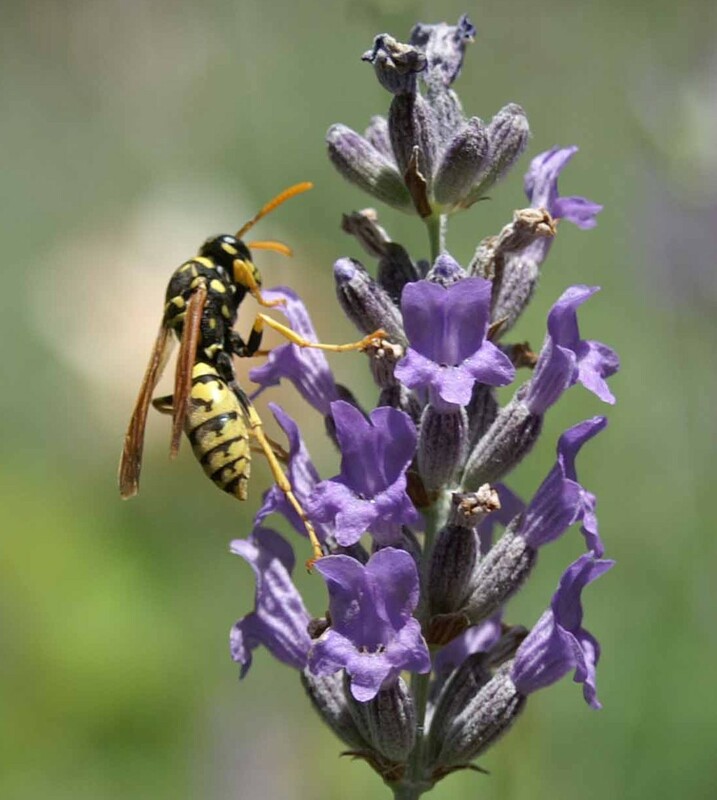 Food source(s): Adult Paper wasps take nectar from flowers, but prey on insects such as caterpillars, flies and beetle larvae which they feed to larvae. They actively forage during the day and all colony members rest on the nest at night. On several occasions I have witnessed Paper Wasp’s nests being attacked by ants whilst still apparently viable. Last September I found a dislodged nest on the floor of the terrace covered in ants, which I ‘borrowed’ from them for a few minutes to photograph. 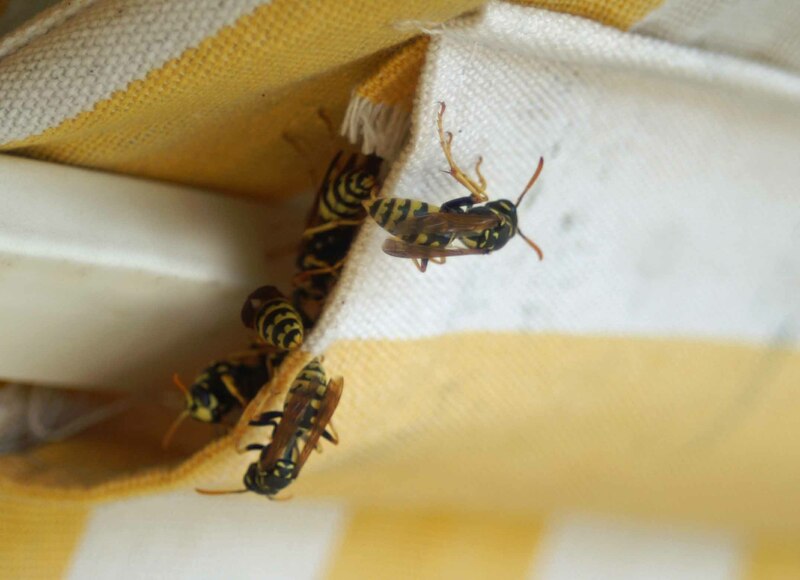 I don’t know for sure that there is a connection, but simultaneously with the demise of the nest a group of Paper Wasps located themselves inside a tubular pocket of fabric covering one of the horizontal supports of the hood of our swing seat. Individuals flew in and out on a fairly regular basis and there were always one or two guarding the entrance that met and checked out each returning wasp. This entry was posted in Insects of Southern Spain, Nature and tagged paper wasps, polistes gallicus, social wasps, wasps nests suspended from roofs, wasps with dangling legs. Bookmark the permalink. I am a lot scared of wasps but these photos are incredible. I was just doing a Google search on wasps with long back legs and came across your blog which answered my question. Thank you! You seem to enjoy the same subjects as I do. 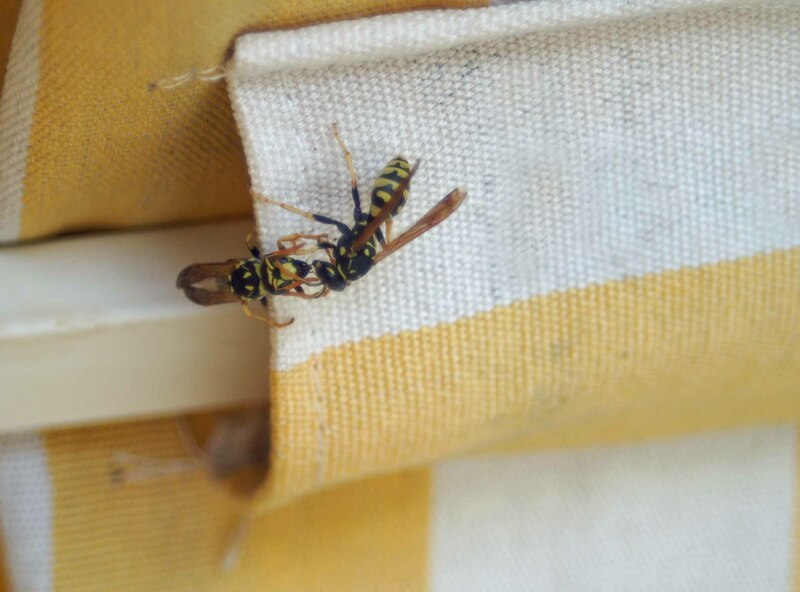 I have paper wasps/polistes on a daily basis in the garden in Spain, Alicante region, where they gather in the autumn sun in what appears to be mating sessions. The are not aggressive to humans, but fly on and around large leafed plants, where they seem to mate vigorously, but quickly. I have a film of their actions which is interesting to watch. How fascinating! It sounds like that’s happening when new queens emerge and are set upon by eager males all desperate to mate.